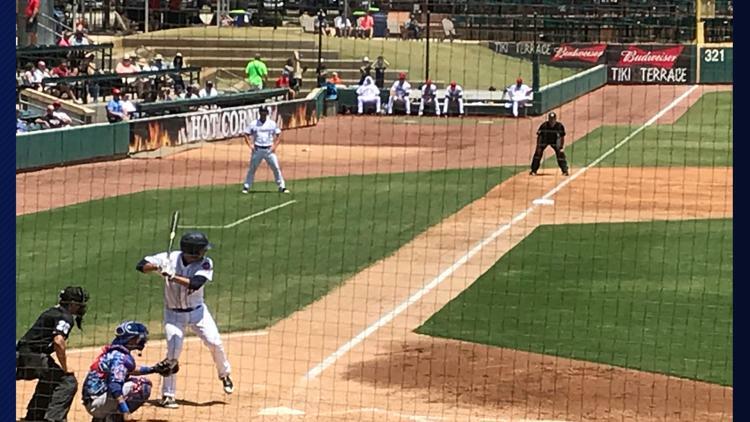 Back to the Minors is our weekly feature that looks at the great minor league sports teams that we have in Jacksonville. This week, a lunch break at the ballpark for us. I am lucky enough to be able to look outside my office window at the Baseball Grounds of Jacksonville. I can go from sitting at my desk to sitting in the stands in less than five minutes. 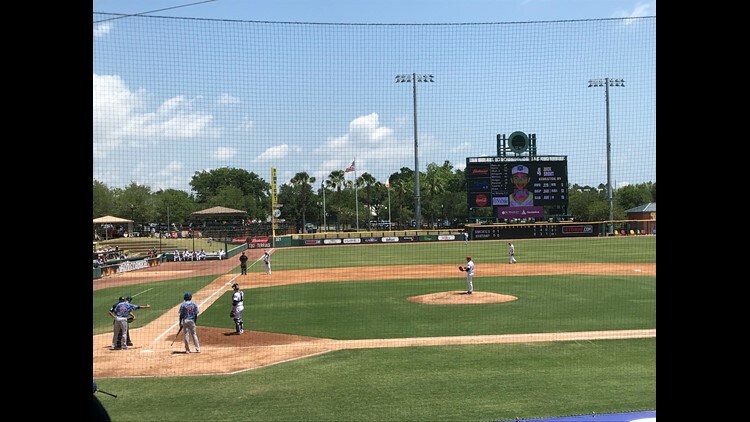 So with the Jumbo Shrimp's first "Business Persons Special", a Wednesday 12:05 p.m. start, I could not resist the opportunity to walk over (on my "lunch break" of course), grab a hot dog, and catch a few innings of day baseball. I'm not going to post any close-up photos, lest we identify anyone skipping out on work (or school...there were a fair number of a school-aged kids for a weekday day game). The crowd itself was an interesting mix of people in business dress clearly just out of a board meeting, others who took the day off, and elderly groups (some of whom came on buses from nursing homes). A pretty well known JSO officer even tweeted a photo of himself and his son "taking the day off" to enjoy some baseball. Let me tell you something ... the day itself was GLORIOUS! Sunny skies, not too hot, and a nice breeze. Oh, and the Shrimp won 3-2. The next "Business Person Special" comes Tuesday, June 12 for a 12:05 p.m. matchup with Biloxi. It will probably be a little hotter that day but if you can, take a half day (or invite the boss to go with you). Make sure you arrive early and grab seats in the shade. There's no better sports deal in Jacksonville and no better way to spend part of your "work day". The Jacksonville Armada hope last Sunday night was the start of a long-run in the U.S. Open Cup. The 'Boys in Blue' knocked of the Villages S.C. 2-1 in a chippy play in game at Southern Oak Stadium (Jacksonville University). Instead of doing a full game recap, let me tell you this. Southern Oak Stadium, while very small, is a fun place to watch soccer. Besides the small grandstand, you can stand along the entire length of the pitch (opposite the grandstand) or sit with Section 904 in bleacher seats close enough for players to leap into and celebrate goals (see the video of the Armada's game-winner I took with my cell phone below). The Armada announced attendance at 534, but it felt like there were a lot more people there. 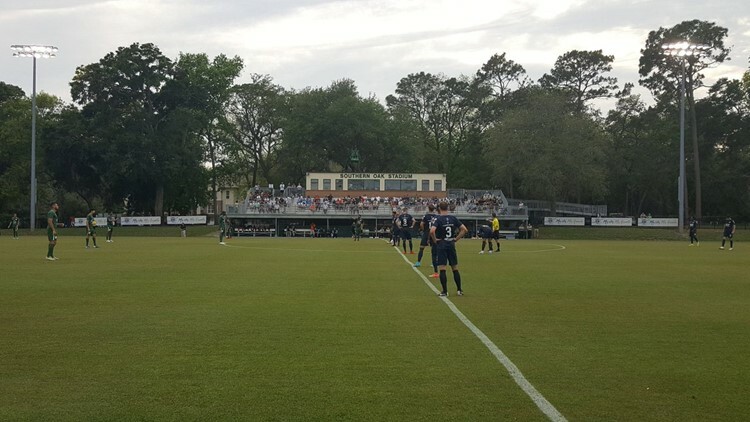 The Armada will play their regular season games at the much larger Hodges Stadium at UNF, but you can see them again at Southern Oak Wednesday in round two of the Open Cup against a former NASL rival, the Tampa Bay Rowdies, now of the United Soccer League. Flower lei's and grass skirts will be back in fashion this Saturday night as the Jacksonville Sharks host "Hawaiian Night" at the Jacksonville Veterans Memorial Arena. The team is coming off their second National Arena League victory of the season, a 48-31 win over the Maine Mammoths. The 2-3 Sharks will try to even their record Saturday with kickoff against Leigh Valley beginning at 7 p.m. Tickets are available here starting at $11.